Galvanized Watering Can with Clear Powder Coat. With the assistance of our dedicated team of professionals, we are providing a premium quality range of Garden Watering Can. Green Watering Can is unique shaped, beautifully painted and well finished by our expert professionals. We also take up customized orders so that our clients get maximum satisfaction from our products. Our products can enhance your collection of garden accessories. 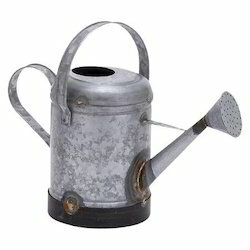 Available in stunning designs, our watering cans are essential utilitarian item for all plant lovers and gardeners. Iran Garden Water can Finish Golden Powder coated. Our company offers its clients with a wide range water canes that are made out of highest quality of aluminum. These are offered with two handy handles to make it easy and compact to use. We offer our clients with high quality water cans at highly competitive prices. These can be provided to our clients in customized sizes and specifications as per their requirements. Moreover, these are stringently tested for quality before supplying these to the clients to ensure that they get a qualitative range. 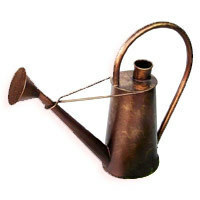 Having a copper antique brushed gold finish the watering can/fountain is actually made of iron thus offering durability. It is very useful in watering plants in the garden thus has both utility and beauty. We offer Garden Watering Can to our clients.